The Congress, which is the single-largest party with 16 MLAs, has already staked claim to form the government in the coastal state. The opposition party's claim comes at a time when Goa chief minister Manohar Parrikar, 62, is admitted to the All India Institute of Medical Sciences in Delhi for a pancreatic ailment. Leader of opposition in the state assembly Chandrakant Kavlekar said that the Congress had enough support to form the government in Goa. "We have the required numbers. I am not going to tell you whom we are in discussions with, but we need the support of 21 MLAs and we have more than that," he said. 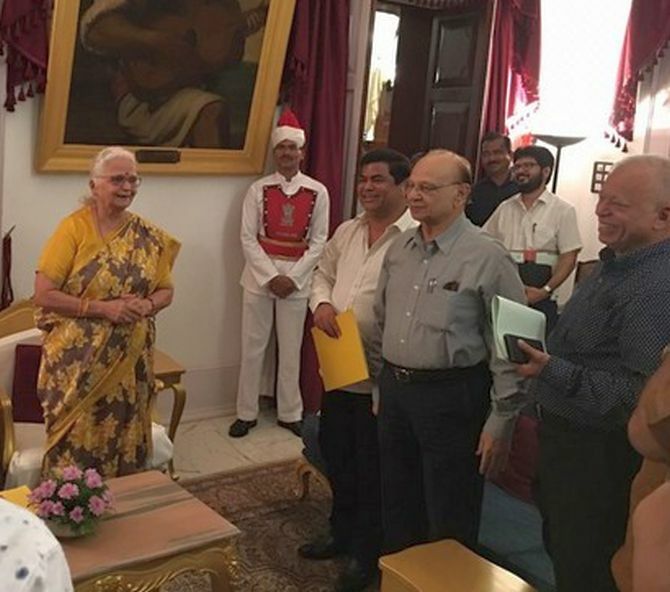 The Congress legislators, led by Kavlekar, had met Governor Mridula Sinha on Tuesday and demanded a floor test by the Bharatiya Janata Party-led government to prove its majority in the assembly. The BJP has 14 seats in the assembly, the GFP and the MGP have three each and the NCP has one. There are also three independent legislators. Kavlekar claimed the political situation in the state was in the favour of the Congress as there was a lot of "discontent" among the ruling coalition partners. "You have seen how the BJP observers came to Goa and met their legislators, former MLAs and alliance partners. They are also talking about inviting a leader from one of the allies to head the government. "This has created a bitter situation as allowing one alliance partner to head the coalition will upset another," he said. Kavlekar also claimed that a section within the BJP was upset over the possibility of a leader being "imported" from outside and was in touch with the Congress for joining the opposition party. "We need not go to anyone with the proposal of supporting or joining us. In fact, they are coming to us with proposals," he added. The Congress leader had earlier said the BJP might force the dissolution of the Assembly and another election in just a year-and-a-half. The assembly polls in Goa were held in February, 2017. The Congress legislators have urged the governor not to allow the Assembly to be dissolved. BJP national general secretary Ram Lal, who, along with two other senior leaders, was deputed by the party's central leadership to take stock of the political situation in Goa, had on Monday said the state government was stable and there was no demand for a change in the leadership. He had said this after a meeting with the party's MLAs, former legislators and core committee members. According to Ram Lal, the allies of the saffron party had conveyed that they would abide by any political decision taken by it. On May 18 too, the Congress had staked claim to form the government in Goa, citing the example of Karnataka, where the largest-party, the BJP, was invited to form the government after the Assembly polls threw up a fractured verdict. The Congress had said it was not invited to form the government in Goa after the assembly polls last year, despite emerging as the single-largest party. The party representatives had also met the governor on September 7, urging her to intervene as the state administration was suffering due to the failing health of the chief minister.